Slides and code from DDD5 are now available over here. Audio and video to follow. Also, we’ve created a group over at the social networking site Facebook. Please do join the group if you are a Facebooker! I know that I am not the first person to spot this anomaly: at the time of writing, it is possible to be whoever you want to be over at Facebook. 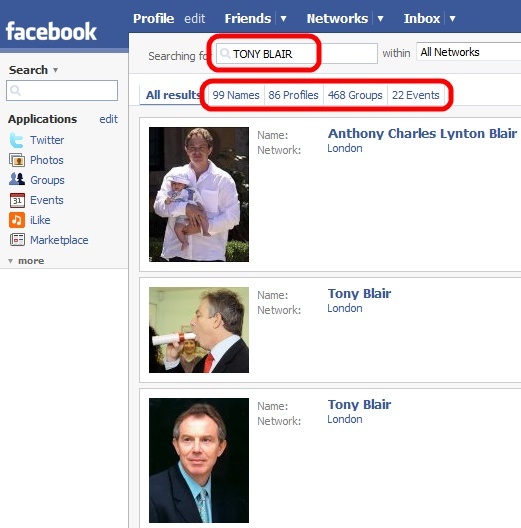 Take for example a quick Facebook search (login required) for Tony Blair. Again, at the time of writing, it revealed no less than 99 Tony Blairs, many of whom use photographs of the UK’s ex-Prime Minister. Here’s the profile link to the first item in the screenshot below. And it seems that even Cherie is in on the act too. Whilst this impersonation issue is probably widely known already, as the profusion of impersonators over at Facebook demonstrate, what problems does this pose for the social networking world? Well, if you happen to share a name with a big name celebrity, such as George Bush, Bill Gates or Tony Blair to name but a few, then there is a chance that your social networking user experience is going to be somewhat different from those with less popular names! I would imagine that you’ll get more folks interested in joining your social network (becoming a friend). Facebook has the concept of a “Wall”, people can “write on your wall”: it’s likely that your wall is going be the subject of graffiti or vandalism if you share your name with a less than popular counterpart. Of course, the more socially popular namesakes might attract a better circle of wannabe friends. A lot of social networking folks have their “profiles” publicly visible. If you have a famous name, it’s quite likely that you’ll have to keep your profile private, which probably isn’t a bad thing (more about this in a later posting). I’ve just checked a handful of the Bill Gates and Frank Skinner folks over at Facebook, a lot of them have their profiles closed (i.e. private). Galloway’s attempt to add some credibility to his Facebook profile is still not enough, in my opinion. Granted it uses language that I would expect him to use (“comrades”) and it makes reference to an external site that may provide further credibility. MySpace is yet another social networking site, so the credibility offering may be reduced – having said that, I’ve just checked Galloway’s MySpace site and it’s littered with the stuff he rants on about (there aren’t many folks who would want to impersonate him to that level, trust me). Facebook – how honest are you? Via The Moth, I was interested to see Peter Foot (mobile device guru) is working on a Facebook .NET CF codebase. It seems that Facebook is aiming to be an all-encompassing, omnipresent and accessible social networking site. This is probably the key to such a site: accessibility. Users don’t want to be forced into using a regular sized PC (other types of computer are available) in order to update their presence information. Follow the progress via here. I noticed on Steve Lamb’s blog, the day after I fired off a Facebook invite to him, that he has some security concerns with the Facebook registration mechanism. And rightly so. Were it not for a large element of honesty, it’s remarkably easy for me to sign up to Facebook and pretend to be somebody else. Steve’s right to question this issue, it and many others have been on my mind for a while now: why do we have so many social networking sites and why do people sign up to them? What’s the attraction? What do we get back from them? How are they improving the quality of our lives? Are they adding any value to the community? Did you know that if you upload your date of birth, hometown, occupation and High School info to a social networking site such as this one that you are giving a potential thief more than enough to commit identity fraud? Anyway, I’m still writing the blog post that I mentioned here, expect this topic to be raised in that post too. Check out the guest list – Dr.Neil Roodyn could be making an appearance – not to be missed! For the third time this year I found myself at Murrayfield. Two gigs and one rugby match. I don’t know what was worse, watching Scotland getting beating by Italy in a matter of minutes or the two gigs. The first gig, back in May was a truly bizarre mix of tribute bands: The Beatles, Abba, Queen and Led Zeppelin…that was 50% “ok” for me. Except that it wasn’t, Led Zeppelin (tribute) weren’t at all good and Queen (tribute) was recognisable, but nowhere near as good as One Night of Queen from 2006. Today’s gig, Bryan Adams, should have been a “dead cert”. After all, I’d seen him live in 1991 at the Milton Keynes bowl (along with Thunder and three other metal acts that can’t have been that memorable). Sixteen years ago, he played to a full stadium, glorious sunshine. Today, he played to a pitch load of wet fans and some less wet fans in the lower east stand – no sign of the summer sunshine that we should have at this time of year. With the weather we’re having, anybody would think that we’ve done something to alter the weather over the last forty-fifty years. 1. Umbrellas should not be allowed. If the band don’t need them, why should you? 2. Camera ‘phones should be banned. It felt like everybody had one of these damn things, filming and photographing, all I could see was a huge array of 2″ screens. People: you are there for the gig – why spend half of the gig trying to get a handful of shots on a low-resolution camera? Not 10 years ago, cameras were banned at gigs, heavyweight bouncer-types would descend upon you and relieve you of your spool (film). 3. Open-air venues only work if the sound system is designed and installed by people who are expert at it. The sound system use at this event and the tribute acts was appalling. Unless you were close to the front at the centre, which was impossible for Silver ticket holders for reasons I will discuss in a moment, the sound was grossly unbalanced, tinny and very distant. I’d like to bet that Metallica at Wembley earlier this month sounded awesome…I won’t be missing my next opportunity to see them live. I was thwarted from getting to the gig because of the excessive cost of that “Joseph & the Amazing Technicolor Dreamcoat” show in the West End – my missus wanted to go to that whilst I was getting a sore neck at the ‘tallica gig. I lost out because of the cost of some other show…how does that work? [rhetoric, of course]. I digress. 4. Scam 1. Never have seen a sizeable square shaped area in front of the main stage reserved for people who bought Gold or VIP tickets. That’s just extortion. I don’t believe for one minute that Bryan Adams would entertain scamming his true fans in this way. I believe that it was a venue scam, designed purely to raise more cash to compensate an ailing events business. With the exception of Yngwie Malmsteen (great video here), I’ve never attended a gig that wasn’t sold out…except at Murrayfield. Don’t scam fans. 5. Scam 2. Just after the ticket desk, there was a portacabin with a banner: “food/drink tokens, 3 for £10”. Naturally we challenged the vendor, “what, can’t we just pay with cash money?” I’m sure you can imagine the response: “no, but you can buy tokens inside, but there will be a queue”. So we bought a 9 tokens for £30. One token == one beer OR one item of food OR two soft drinks. Net result after we got home – three tokens left over. So the venue/event organisers scammed us out of an extra tenner. Well done. This act alone is enough to make me never attend a gig at your venue again. And since everything was served in plastic bottles, I do wonder what the plastic recycle policy is at such an event? Don’t scam fans. Oh, I almost forgot, the music. Adams did the right thing by opening the gig via the centre stage, as can be seen the photograph above. This meant that the Gold/VIPs folks got a raw deal. However it didn’t last, after a couple of tracks he retreated to the main stage, only to return to the centre stage for the third encore which saw him hand pick the local talent from the audience. Incidentally, the centre stage performance was much better than the main stage, even though the main stage speakers were still in use. Centre stage performances, a’la Def Leppard at the Glasgow SECC, are far better, giving the whole audience a sense of involvement – event organisers, please note. I couldn’t help but notice what I thought was miming on more than one occasion, it turns out I wasn’t alone in my thoughts about this either. This was confirmed when I spotted Adams running from one side to the other, no microphone in sight, yet still the vocals could be heard…I got the impression that Adams’ primary guitarist (almost a look-a-like) was also chipping in as and when required. Summer of 69 arrived fairly early in the set…which was odd, perhaps because that was one of the few songs I was there for. Anyway, I put up with the rain, the idiots with umbrellas, the pratts with their camera ‘phones, the selfish fans who put their 5 foot tall offspring on their shoulders thus blocking the view for a lot of folks behind them, including my party. Overall, Adams stage performance was pretty damn good given the weather. However, I don’t think those were his speakers of choice. The event sound did not fill much past the main stage and lacked any depth or power. The light show was basic, little use of the late evening darkness was made. That said, the centre stage lighting was reasonable. I’m busy preparing a post about the sheer profusion of social networking sites that are now available. In the meantime, Robert Scoble makes reference to it [the number of social networking sites] when he links to some recent usage stats. Call For Speakers and Helpers! On the 6th October 2007 the UK SQL Server Community will be holding a day long conference full of SQL content. There will have 20 sessions covering everything from Maintenance plans through CLR stored procedures to Data Mining. What are your thoughts on queuing? What I like about this survey is the fact that once you’ve completed it, you can view all the results. In this, the eighth Community podcast, I’m chatting to Ben Hall and Chris Gaskell. This podcast was recorded after the DDD5 GeekDinner…it was rather late, many beers had been consumed (but not by me, I might add!) Huge apologies to Ben – a combination of over-zealousness, a wet floor, no grip whatsoever from my shoes, bar stools and me ending up flat on my back…and I took Ben out too, he ended up on the floor! Amazingly, I was sober, having had a mere two pints over many hours. Anyway, in this show, Chris and Ben get vocal about the benefits of attending a developer event like DDD5 and they promote their respective local user groups, NxtGenUG and VBUG. Download the podcast here. Transcript to follow. I have a new podcast feed available too, you can subscribe to it here – and it works with Apple’s iTunes! In this, the seventh Community podcast, with no sign of James Bond, I spend a while chatting to four pretty cool guys – I’ll let them introduce themselves. This podcast was recorded at the DDD5 GeekDinner, at the Riverside in Reading…it was late, a few beers had been consumed! In this show, we plug DotNetRocks, discuss the merits of travelling to DDD and face-to-face meetings. Craig also demonstrates his total command of the Polish language…with apologies, of course, to Artur Wasnik.